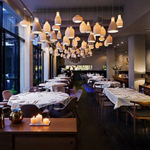 In restaurant environments Pendant Play is exploited to create visual interest. Various lighting qualities are achieved by varying the type of illumination, the number of fixtures, the distance between fixtures, the length and regularity or irregularity of suspension from the ceiling, and their placements in spaces. The interior archetype, Pendant Play, was first identified as a practice in retail spaces, and later in boutique hotel design. Initially it was named Animated Field to describe the sparkling and energetic nature of its spatial effect. In retail the lights were employed as a display technique.1 The term Animated Field lacked memorability; this thesis renames the practice as Pendant Play. The publication of the restaurant design practice of Pendant Play emerges in the 1960 and 1970 decades. Simple shades or incandescent lamps (light bulbs) were arranged in grids, and used for general illumination. In Café at The Cavalieri Hilton (1963) in Rome more than 200 simply designed pendants, designed by Leslie Wheel, were suspended about three feet from the ceiling; the array of pendants made the high ceiling visually lower, and created a spectacle in the air of the dining room. The pendants in the Café at The Cavalieri Hilton cover the entire ceiling. In comparison, the Concourse Restaurant (1971) in San Francisco illustrates an example of a gridded Pendant Play in a portion of the ceiling area—and on a wall. The larger-size pendants in the café at The Cavalieri Hilton create a very different quality of light and a variant spatial experience than the smaller fixtures used in The Concourse. New York City restaurant designer Jeffrey Beers ushered in a new reiteration of Pendant Play in 1988 for the China Grill. Large, randomly scattered pendants cover the entire ceiling of the dining space. Because Beers also chose to vary the angle of the pendants, they resemble space ships floating in the air, as if they are capable of moving around the dining space.2 Throughout the 1990 decade designers tried a range of reiterations with the design of Pendant Play, varying the size of pendants from bulb-size to chandelier-scale and obscuring a ceiling grid. In the 21st century, Pendant Play continues as a popular practice for dining environments. Although the designs have become more diverse, the pendant size has grown smaller than a regular lamp (light bulb). LED light fixtures are used increasingly to create diverse lighting colors, as well as to reduce heat and electric energy consumption. In the dining room of the restaurant Maimon Nishiazabu (2003) in Tokyo, an array of small LED light fixture-pendants is covered with white feathers. This Pendant Play contributes to the illumination of the space as a secondary lighting source. Also in Tokyo, Pendant Play in the restaurant Dazzle (2006) becomes a significant spatial feature. Located on the eighth floor of the pearl jewelry boutique (Mikimoto building), Dazzle features a constellation of twinkling crystal-studded LED-lit pendant globes. These pendants, suspended mid-way between the ceiling and floor plane, visually lower the ceiling. 1) Leah Scolere, “Theory Studies: Contemporary Retail Design,” (M.A. Thesis, Cornell University, 2004), 120-122; Mijin Juliet Yang, “Contemporary Boutique Hotel Design (M.A. Thesis, Cornell University, 2005), 77-78. 2) Andrea Loukin, “China Grill,” Interior Design (Sept. 1988): 256-259. 3) Martin M. Pegler, Contemporary Restaurants and Bars (New York: Visual Reference Publications, 2004), 92-93. 4) Evidence for the use and the chronological sequence of Pendant Play as a restaurant archetype was developed from the following sources: 1960 Coffee Shop, The Cavalieri Hilton  Luccichenti, Pifferi, and Ressa, Architect; Leslie Wheel, Lighting Designer; Rome, Italy in "Rome," Interior Design 34, no. 11 (Nov. 1963): 127; PhotoCrd: Anonymous / 1970 Concourse Restaurant, Bank of America World Headquarters  Edward Brimm and Associates, Interior Design; San Francisco, CA in "Concourse Restaurant," Interior Design 42, no. 4 (Apr. 1971): 128; PhotoCrd: Anonymous; Lindy's Restaurant  Fred B. Shallow, AID, Interior Design; Rockville Centre, NY and Massapequa, NY in "Five Restaurant Interiors," Interior Design 44, no. 10 (Oct. 1973): 176; PhotoCrd: Tom Hinckley; 1960; Tuttles Restaurant  Carson Bennett Wright; Miami, Florida in "Tuttles Restaurant," Interior Design 50, no.1 (Jan. 1979): 209; PhotoCrd: Bill Hedrich, Hedrich Blessing / 1980 Alo Alo  Adam Tihany; New York City in Edie Lee Cohen, "Alo Alo," Interior Design 56, no. 9 (Sep. 1985) 280; PhotoCrd: Peter Paige; China Grill  Jeffrey G. Beers; New York City in Andrea Loukin, "China Grill," Interior Design 59, no. 9 (Sep. 1988) 257; PhotoCrd: Paul Warchol / 1990 Pomodoro  Adam Tihany; Beverly Hills, CA in "Pomodoro," Interior Design 61, no. 4 (Apr. 1990): 189; PhotoCrd: Toshi Yoshimi; Tizi Melloul  Suhail Design Studio; Chicago, IL in Martin M. Pegler, Contemporary Restaurants and Bars (New York: Visual Reference Publications, 2004), 93; PhotoCrd: Doug Fogelson; China Grill  Jeffrey Beers; Las Vegas, NV in Matteo Vercelloni, New Restaurants in USA 2 (Milano: L'archivolto, 2003) 22-23; PhotoCrd: Paul Warchol; Daidaiya Ginza  Hashimoto Yukio Design Studio; Tokyo, Japan in Joachim Fischer, ed., Restaurant Design (Stuttgart, Germany: Daab Press, 2004) 146; PhotoCrd: Paul Warchol / 2000 Daidaiya Ginza  Hashimoto Yukio Design Studio; Tokyo, Japan in Joachim Fischer, ed., Restaurant Design (Stuttgart, Germany: Daab Press, 2004) 146; PhotoCrd: Martin Nicholas Kunz; Tradgar'n  Studio Gron; Gothenburg, Germany in Nicholas Adams, "Tradgar'n," Architectural Record 189, no. 7 (July 2001): 97; PhotoCrd: Hans Wretling; China Grill  Jeffrey G. Beers; New York City in Henry Urbach, "Gear Shift," Interior Design 72, no.11 (Sep. 2001): 115; PhotoCrd: Paul Warchol; Compass Rose  HHPA; Singapore in Kelley Demon, "Storied Redesign," Hospitality Design 24, no. 7 (Oct. 2002): 61; PhotoCrd: Tim Nolan/Lim Ai Meun; Maimon Nishiazabu  Hashimoto Yukio Design Studio; Tokyo, Japan in Joachim Fischer, ed., Restaurant Design, 154; PhotoCrd: Roland Bauer; Riingo  Glen Coben; New York City in Stacy Shoemaker, "The Big Apple," Hospitality Design 26, no. 4 (May/June 2004) 54; PhotoCrd: Lydia Gould Bessler; Fluff Bakery Café  Lewis Tsurmaki Lewis; NYC in Tara Mastrelli, "Horizontal Vertigo," Hospitality Design 27, no. 3 (Apr. 2005): 162; PhotoCrd: Michael Moran; Dolder Grand  Foster and Partners and United Designers; Zurich, Switzerland in Craig Kellogg, "The Dolder, Bolder," Interior Design 79, no. 6 (June 2008): 266; PhotoCrd: Edmund Sumner. 2) Cho, Jasmin. “Theory Studies: Archetypical Practices of Contemporary Restaurant Design.” M.A. Thesis, Cornell University, 2009, 87-94.